I admit it: I have what I'd describe as a mild addiction to Instagram. I use the social media platform as both a source of inspiration and as a way to share the often mundane but occasionally cool facets of my life (look, another photo of avocado toast!). But while I may shamelessly post pics of my outfits, I would never claim to be an expert. So I decided to enlist a few women who have cracked the code to offer up tips on how I can take things up a notch. Annabelle Fleur of @vivaluxuryblog and Kimberly Lapides of @eatsleepwear stepped in to help me out. With close to one million followers between the two of them, it's safe to say they're well versed in the art of taking the perfect picture. Below, each offers up handy tips, telling me what needs work in my photos. With their gentle guidance, it's easy to see how I can improve on my amateur shots. My hope is that their advice will help you learn a thing or two about taking that #OOTD shot. Read on for expert advice on taking the perfect Instagram shot, and then shop pieces to help you get there. "Absolutely love the shot! 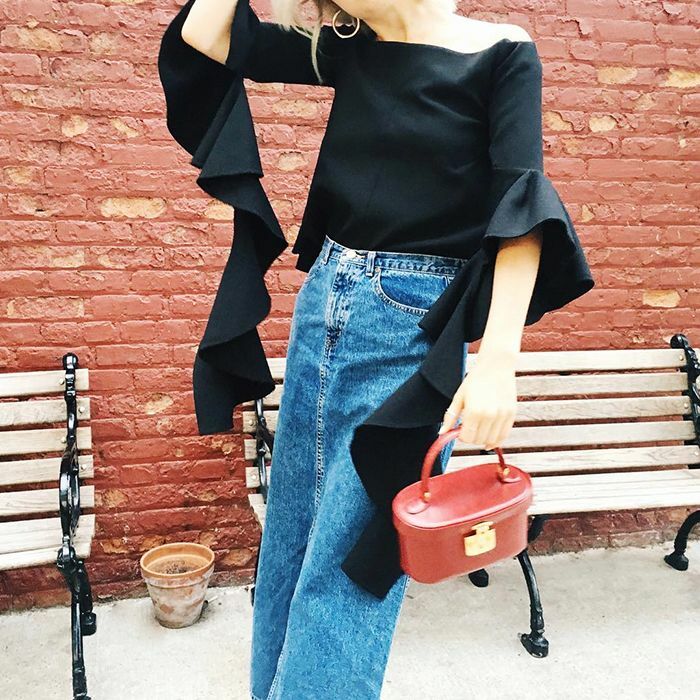 One little thing I'd do differently is show the entire top (i.e., include the shoulders)." "Create a colour story. What I love about this photo is Aemilia was able to find a great graphic background to play off the red in her outfit. Props are everything. Don't underestimate the power of a vintage car or fun graphic wall to really make your Instagram outfits pop." "I like the depth in the photo, it certainly makes shots more interesting; I almost never take photos straight into objects. If I were you, I'd take a few steps back and pose with that bike!" "What I love about this photo is the movement and the shapes created with the body. Always have to work those angles! Pro tip: Make sure your background is clutter-free. You can easily block that small pot with your body when you take the photo for a cleaner and higher-impact look." "Nice shot showing the entire look! I love the chair—it adds a little something to the photo." Hollowed-out pockets make any pair of jeans feel extra special. These velvet sandals work well with both cropped jeans and dresses. Add a pop of colour to your feed with this adorable bag. A woven bag is sure to become a summer staple. Gingham is one fabric that will always work. Get ready to see this skirt on all your favourite Instagram accounts. Add vintage charm to any outfit with a cat-eye silhouette. Retire your white sneakers for the summer, and try slides instead. Found: a top that will meet all your warm-weather outfit needs. Take your vacation photos to the next level with a woven bucket bag. Details are everything when it comes to Instagram. Graphic stripes stand out in any lighting situation. The maxi dress is a breezy way to get dressed up during warmer months. Believe it or not, red is universally flattering colour—and it looks great in pictures.